I’m quite certain that all foodies know his name extremely well, a chef who holds 25 Michelin stars, Joel Robuchon. 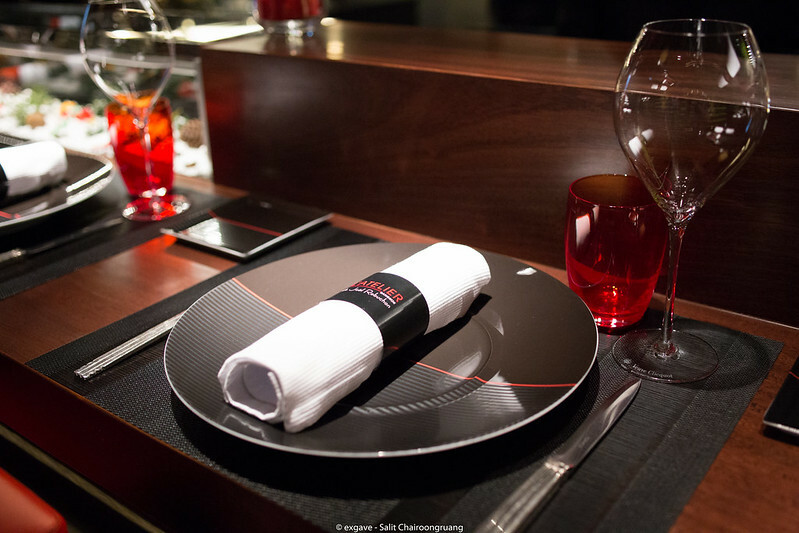 When the rumour becomes true, Joel Robuchon launched his new L’Atelier in Bangkok last week, whence I immediately reserved myself a seat. 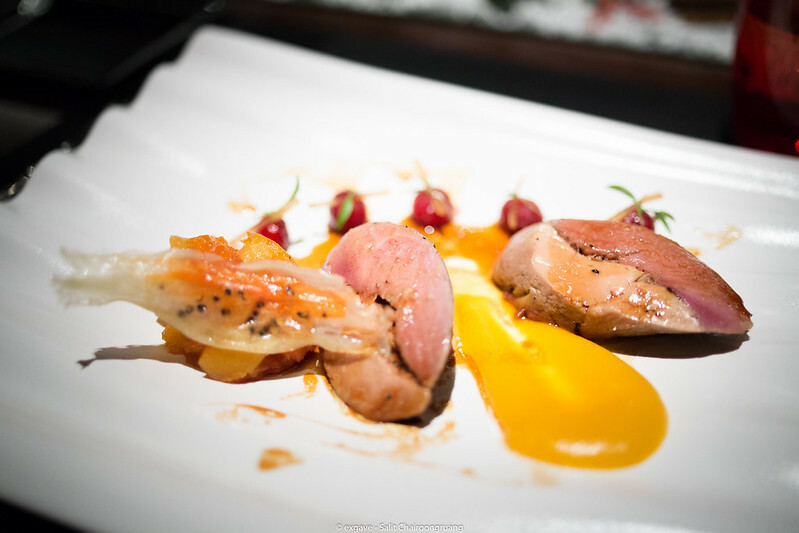 Be noted that reservation is highly recommended as there are many Robuchon fans in Thailand. I’ve heard that the restaurant is fully booked for dinner for the whole month. For me, I’d like to go for lunch since it is less crowded than dinner. There are 3 options for lunch: a lunch set, an a la carte and a discovery menu. 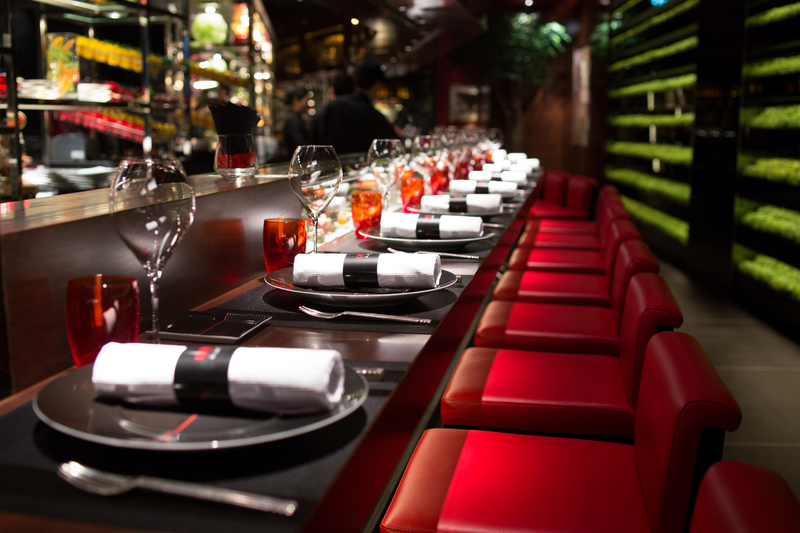 The décor, of course, is kept in red and black with a classy touch like other L’Atelier. The service is doubtlessly top-notch. They even exceeded the unrivalled service at Le Normandie. Pricing here is quite high but still considerable at the same time, compared to its rivals like Le Beaulieu or Le Normandie. There is a cheap option for those who don’t have a deep pocket. Lunch set price is very reasonable for this kind of restaurant such as the 4-course meal of 1850++THB. Today, I went for the 7-course discovery menu (7500THB++) which includes 4 appetizers, 2 main dishes, and 1 dessert. First, I expected the portion to be small as it is a tasting menu but it turned out to be a large portion but I still managed to finish it somehow. As usual, I personally like to have bread to start with. 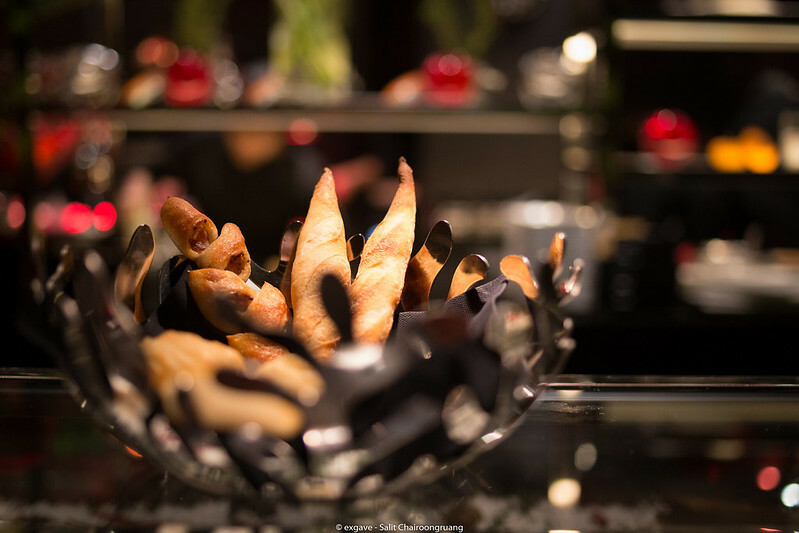 All breads in the classy basket were all tasty and warm. If it is not warm enough, you can ask them to warm it for you. Also you can ask for more bread if you want. 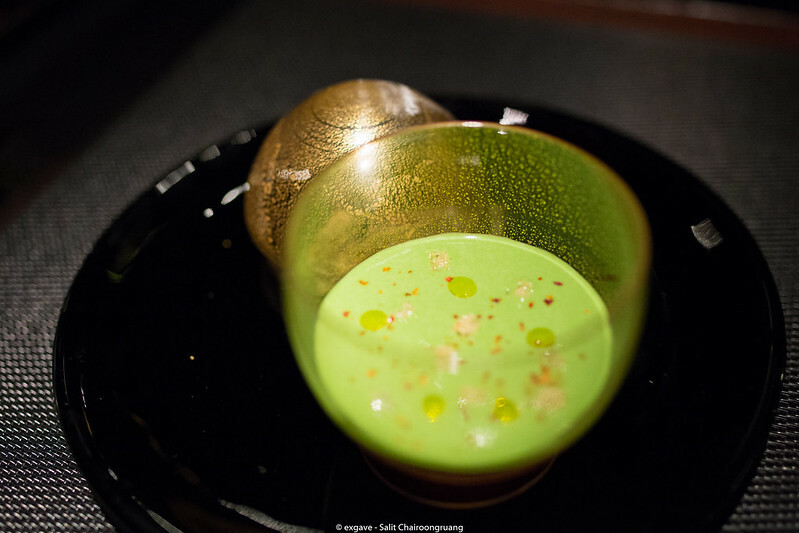 While I enjoyed my croissant, Amuse-bouche of chilled green kale veloute with spicy tomato jelly was placed down. It was light and refreshing with a freshness hint from the tomato. 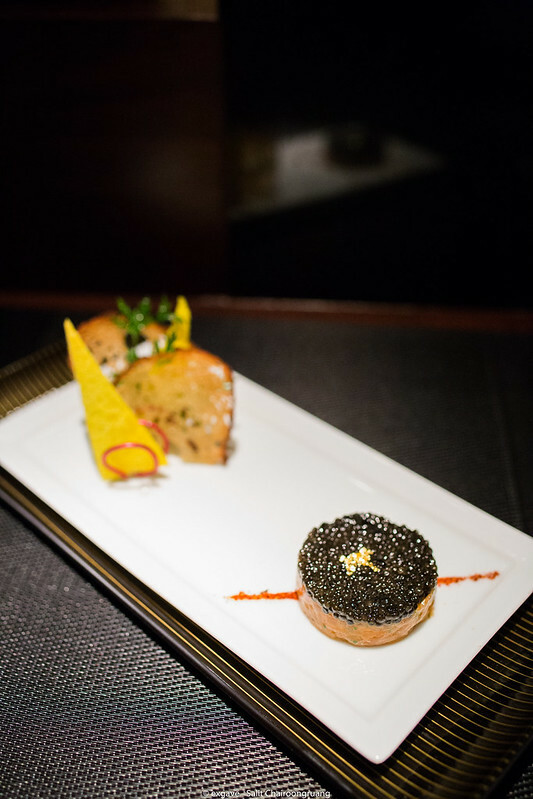 This was salmon tartar with Imperial caviar. 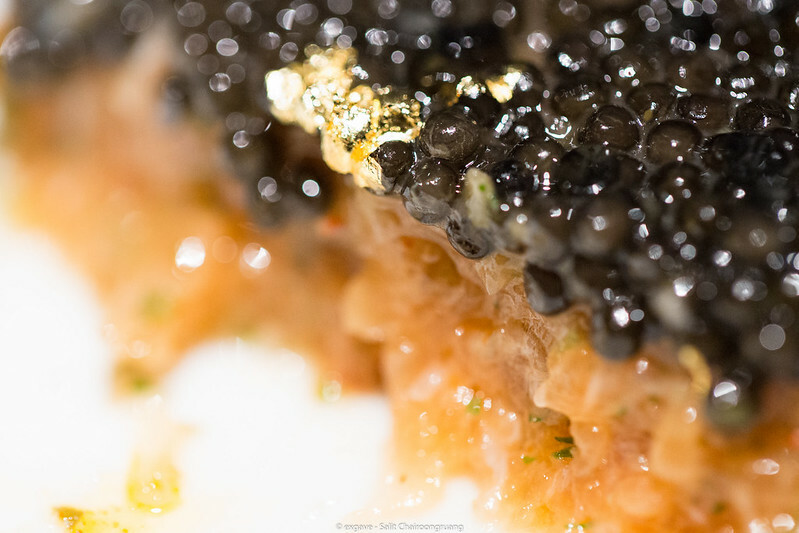 Salmon tartar was well made – rich and thick in flavour. It was quite heavy to begin the course but the red spices underneath the tartar softened it down, which was nice. The next dish was seared sea scallop and kumquat condiments. It was truly amazing!! Scallops were cooked with extreme care. 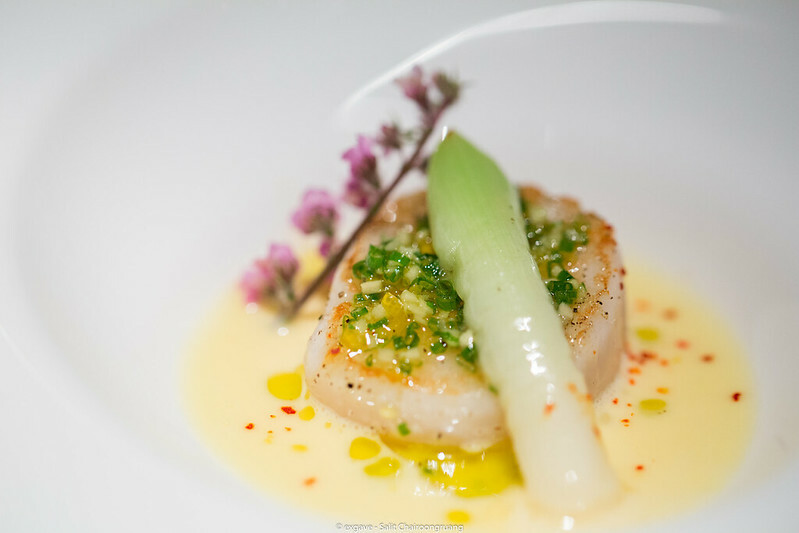 Kumquat cream was lightly sour and creamy which matched perfectly with the scallops. Pepper oil balanced out kumquat cream gorgeously. During this time of the year, it surely is a truffle season. 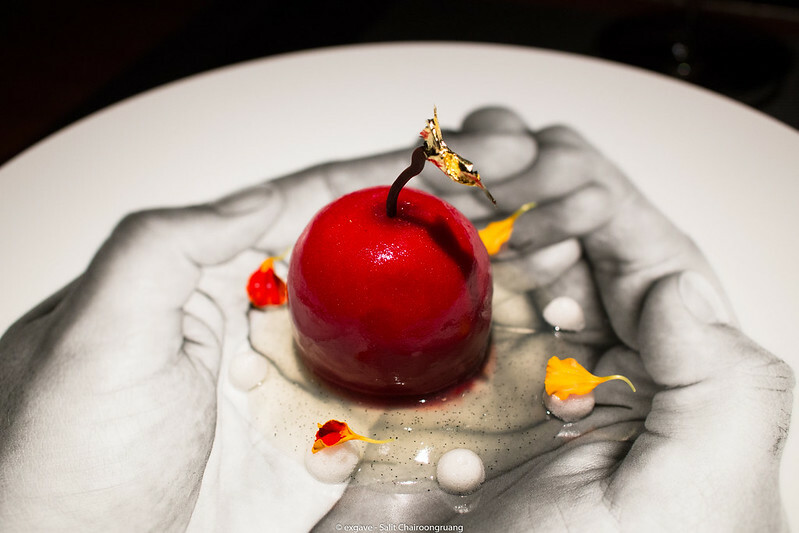 Without doubt, L’Atelier added some truffle dishes on their a la carte menu and discovery menu. 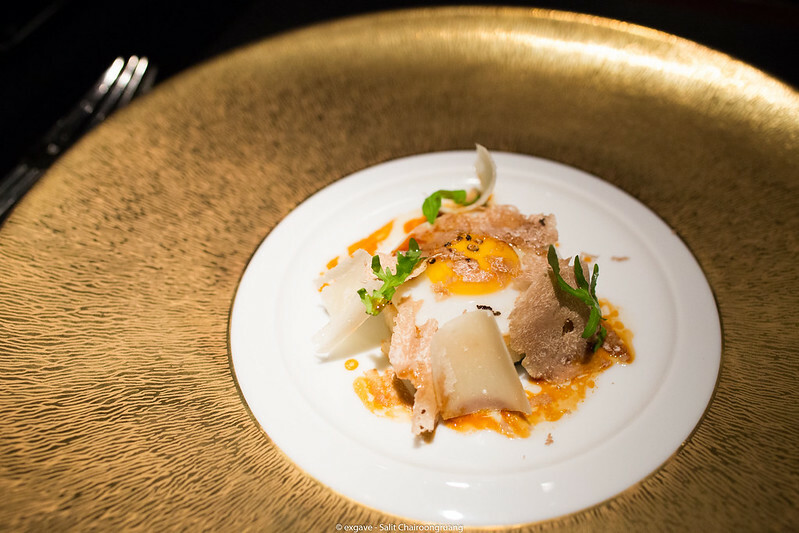 As such, this one is glazed egg, white Alba truffle and golden rice with shaved parmesan. It was simply delicious. The texture of rice is quite similar to risotto but it had less moist and was not as sticky. 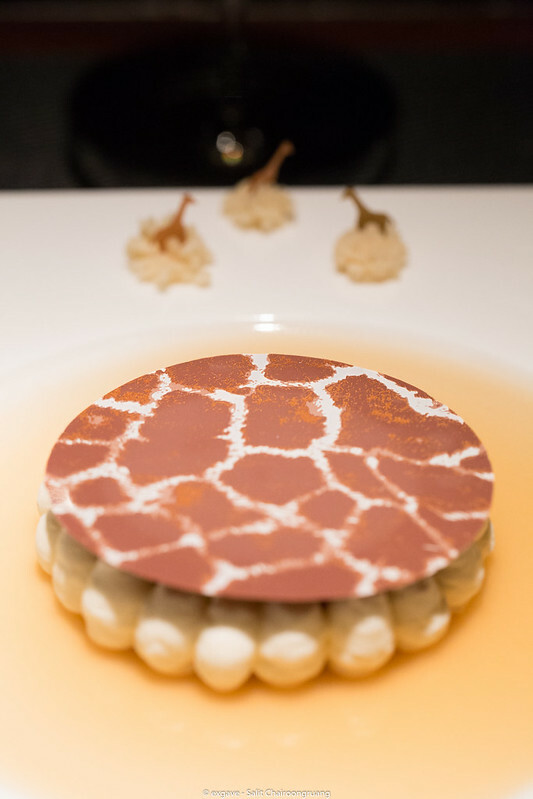 The amount of truffle is just about right – it did not overwhelm other opponents on the dish. It was just simply delicious. 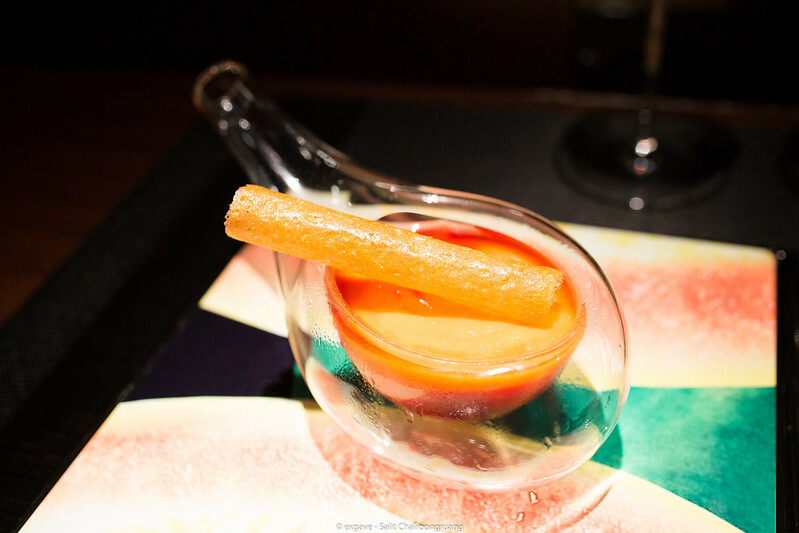 The last appetizer was hot chicken curcuma jelly over goose foie gras and seasonal vegetables. 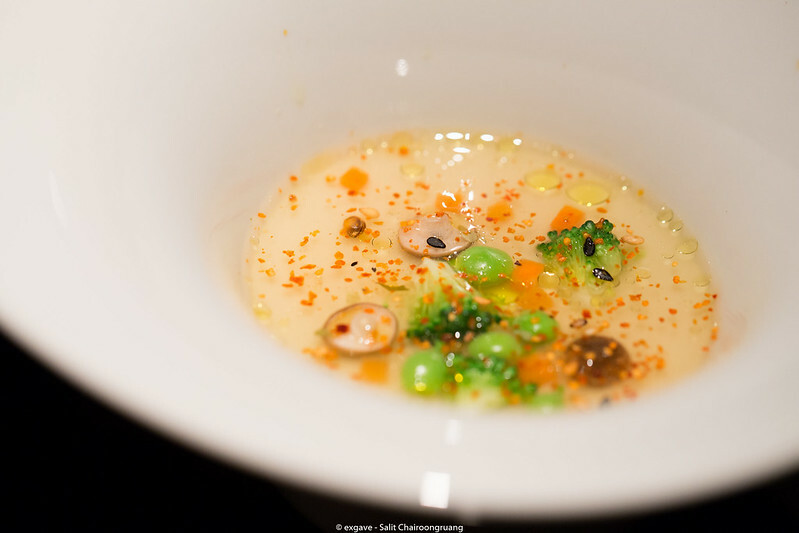 For me, this dish is like steamed egg. Ok, it tasted good, though it did not give me the “wow” impression. It was my least favourite dish among the course. 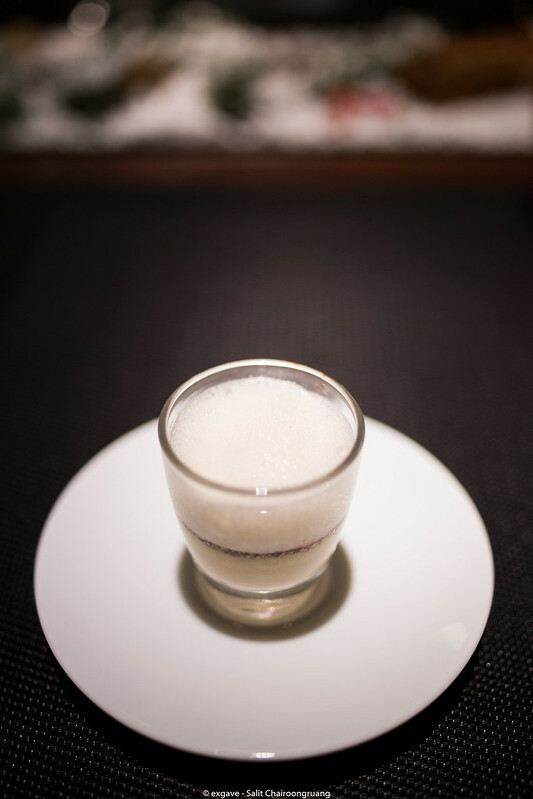 To pair with this course, I did ask the head sommeliers, Mr. Benoît Bigot, to select a glass of wine for me. Unfortunately, I enjoyed the wine too much, so I forgot to jot down the wine label. If I recall it correctly, it was crisp, fresh, round and lightly citrus with fine mineral. He did not disappoint me at all. Such a great recommendation indeed. 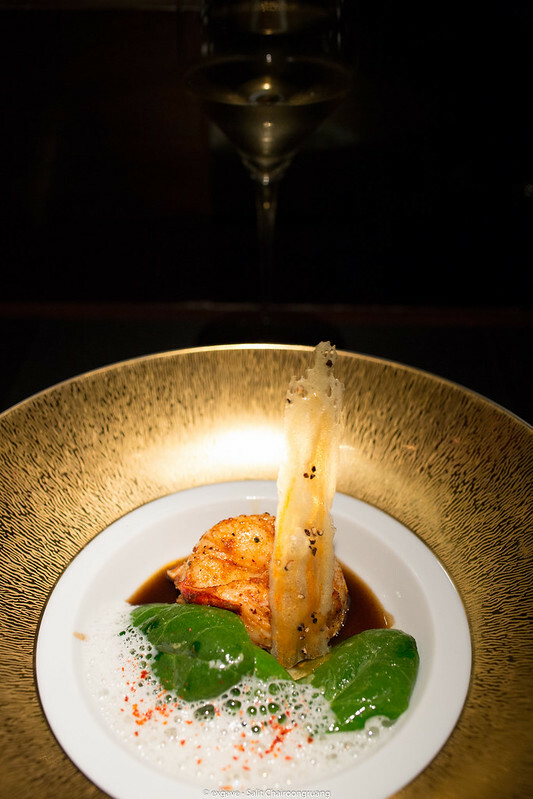 From the sea main dish, it was roasted lobster, baby spinach and black pepper sauce with coconut foam. Pepper sauce was rich, thick and flavourful but it was too hot for my liking. Lobster was juicy and fresh. 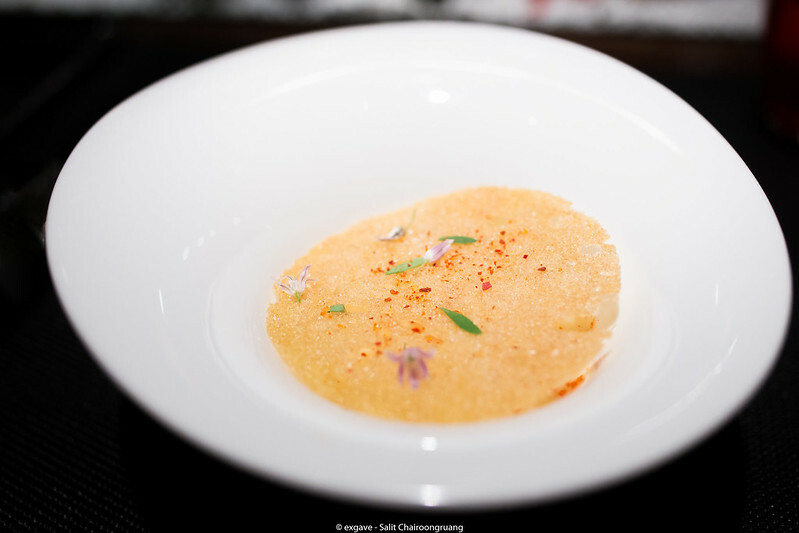 Coconut foam gave another dimension of aroma to the dish which was pleasant. On the other hand, spinach did not seem to play an important role here. 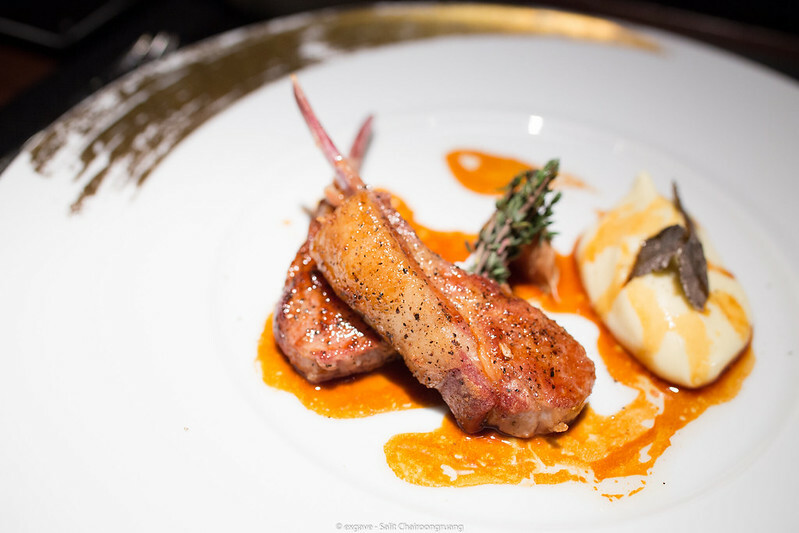 From the ranch, this dish was milk fed lamb cutlets from Pyrenees with fresh thyme and creamy mashed potato and truffle. It surely was the star of my lunch. Lamb cutlets were cooked to perfection. It was packed with thyme aroma and natural sweetness. Juicy lamb obviously came with Joel Robuchon’s signature creamy mashed potato. It was buttery smooth, creamy and light. No one can beat his majestic mashed potato!! 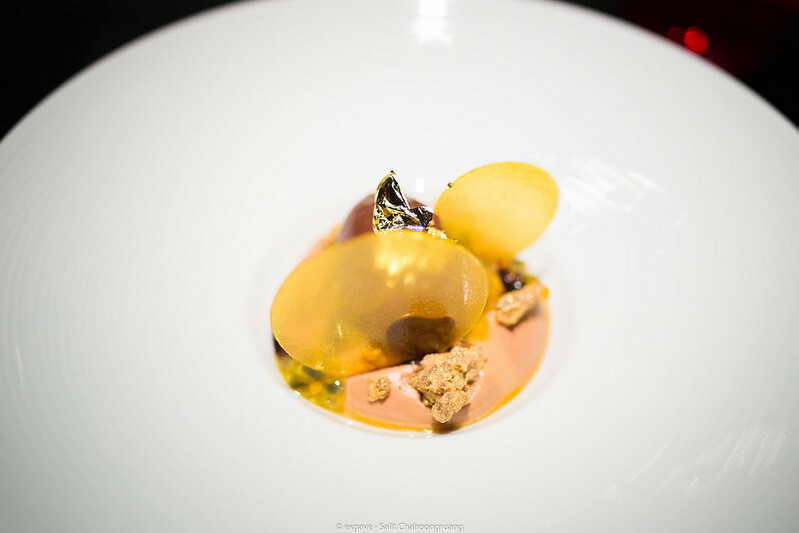 To clean up my palate, a pre-dessert of fresh papaya coulis, guava mousse and black currant sorbet was served accordingly. Papaya, guava and black currant combined together delicately – light and refreshing. So now I’m ready for dessert!! 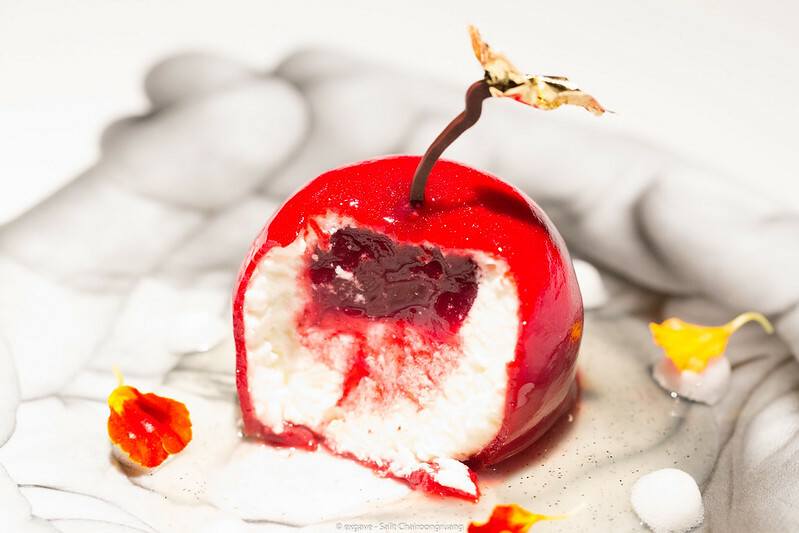 Once the last dish of the course was placed down, I was stupefied by its stunning presentation. Just saying, every plate has a different hand and hand pattern, and also on the other side, there is a backhand image too. 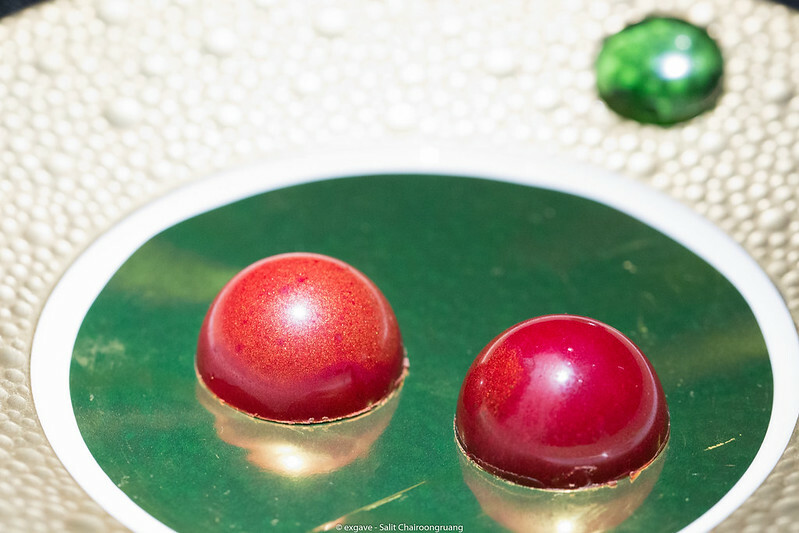 The last dessert was apple cider jelly with Tahitian vanilla and Granny Smith bavarois. It was light, fresh and charming. Apple cider went along brilliantly with vanilla apple gel. To maximize my experience, I asked Mr. Bigot to pair a dessert wine or something with apple cider jelly. He carefully picked a glass of apple cider from Normandy to accompany my last course. It surprisingly matched well with it, as he said, keeping it as simple is always the best. Lastly, I ordered another dessert which is not included in the discovery menu. An additional price of 600THB is required. I let Mr. Bigot, once again, choose a dessert for me. He picked mango and grapes jelly with coconut yogurt. 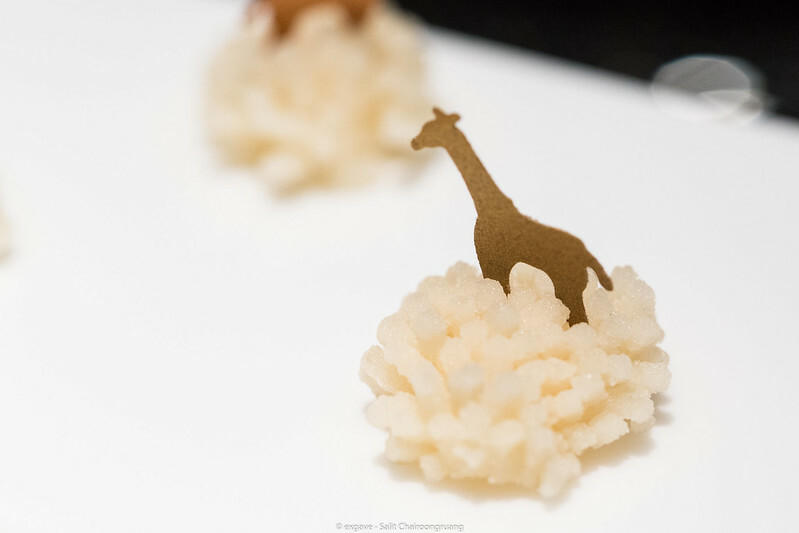 The presentation was cute, as you see, the chocolate sheet with giraffe skin pattern screened on it and tiny giraffe decoration on the plate. I love how they pair mango with grape. It was so amazing. Coconut yogurt balanced sourness from mango and grape fabulously.